﻿"Many know that WHM was closed during World War II under martial law. But, did you know that the temple facilities at the Vineyard Street campus was used by the Red Cross and Civil Defense agency? And did you know that the Japanese language school classrooms were used for public school classes by Wailuku Jr. High, now known as Iao School?" Wailuku Hongwanji Mission was established in 1899 and our first resident minister was Reverend Hojun Kunisaki. Reverend Kunisaki passed away in 1900. Reverend Tessan Funakura was our second resident minister from 1900 to 1906. The first temple was built at the corner of Wells Street and Market Street in August 1902. 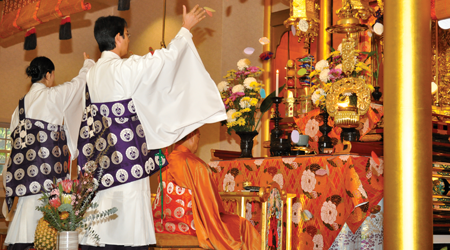 In 1903, the Young Men’s Buddhist Association was formed, followed by the Wailuku Hongwanji Bukkyo Fujinkai in 1905. In 1906 the Gakuen or Japanese Language School was established on land leased to Reverend Funakura from Wailuku Sugar Company for next twenty years. Reverend Kenyu Arai was our third resident minister from 1906 to 1908. Reverend Kagetsu Shibata was our fourth resident minister and served from 1908 to 1909. From 1909 to 1912 Reverend Seiya Kai was our fifth resident minister. Reverend Chikyoku Kikuchi was our sixth resident minister and served from 1912 to 1914. Wailuku Hongwanji observed the 650th memorial service for Shinran Shonin in 1912. From 1914 to 1918 our seventh resident minister was the Reverend Daisetsu Toda and the first Young Men Buddhist Association conference was held in Wailuku in 1916. Reverend Jyonen Nishiura was our eighth resident minister and served from 1918 to 1920. Our ninth resident minister was Reverend Seigai Matsuda who served from May to November of 1920. Reverend Gikyo Kuchiba became our tenth resident minister and held the 25th memorial service for our first minister, Reverend Kunisaki. In March 1926, the acting Chief Abbot Sonyu Ohtani visited Maui and conducted Affirmation Rites. Reverend Kuchiba served from 1920 to 1926. Reverend Yoshu Motoyoshi became our eleventh resident minister and in 1926 our temple’s newsletter, “Michi no Tomo” was started. In 1931, Wailuku Hongwanji Jr. YBA was established. Reverend Motoyoshi served from 1926 to 1933. Reverend Sokuzen Uehara became our 12th resident minister and served us from 1933 to 1934. Reverend Shoi Yamada became our thirteenth resident minister and served from 1934 to 1935. Reverend Gikai Harada became our fourteenth resident minister and served from 1935 to 1936. Reverend Hironori Nishii became our fifteenth resident minister and served from 1936 to 1938. 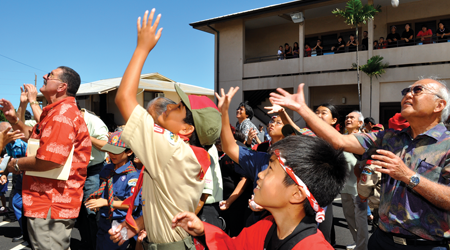 Reverend Nishii activated the Judo Club in his first year of service at Wailuku Hongwanji. Reverend Mitsue Hamada, an associate minister, was the first English-speaking minister at Wailuku Hongwanji. 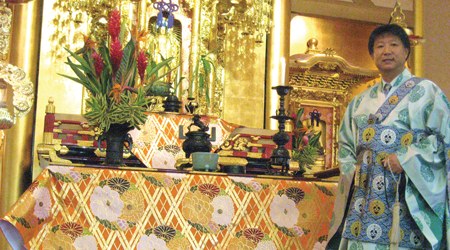 She gave many young children a solid foundation in Buddhism through Sunday school. Reverend Gikai Harada became our fifteenth resident minister and served from 1935 to 1936. In 1937, the Kyodan Riji Kai was organized with the responsibility of temple and Gakuen affairs. Additionally, Boy Scout Troop 40 was established in 1937. Reverend Ryugen Matsuda became of sixteenth resident minister and served from 1938 to 1940. During this time, the Bodhi Club (women’s club) was initiated as well as the establishment of a Girl Scouts troop and a Gakuen for girls. Reverend Seikaku Takesono became our seventeenth resident minister and served us from 1940 to 1941. From 1941 to 1945 all ministers and many active leaders of the temple were interned at relocation centers during World War II.